Children are more likely to eat a nutritious, balanced breakfast if they are served low-sugar cereals, even if they add a little table sugar to their bowls, a new study says. Although children may favor cereal that’s high in sugar, they’re more likely to eat fruit at breakfast when served a cereal containing less sugar, researchers say. The study observed what 91 children aged 5 to 12 at a summer day camp ate when served either high-sugar or low-sugar cereals. In the study, children were divided into two groups. One group had a choice of three high-sugar cereals and the other group had a choice of three low-sugar ones. Milk, orange juice, cut-up bananas and strawberries, and small packets of table sugar were available to both groups. All the children reported after breakfast that they either liked or loved the cereal they’d eaten, whether it was high or low in sugar content. But kids in the high-sugar group ate about two servings, nearly twice as much refined sugar, or 24.4 grams, as the children in the low-sugar group, who ate a little over one serving on average, with 12.5 grams of refined sugar, according to the researchers. And this was true even though the kids who ate low-sugar cereals added significantly more table sugar to their bowls. The children who ate low-sugar cereal ate similar amounts of milk and total calories, and were more likely to put fresh fruit on their cereal than the kids who ate high-sugar cereals. The researchers say their study shows that kids will eat low-sugar cereals and like their breakfasts, even though they think the brands higher in sugar taste better. So the take-home message, they say, is for parents to serve low-sugar cereals, but spice the servings up psychologically by also offering fresh fruit and table sugar. Such a strategy, the researchers say, could reduce the amount of added sugar in children’s diets. Children who were offered low-sugar cereals (Cheerios, Rice Krispies, Corn Flakes) were “significantly more likely to put fresh fruit on their cereal, compared with children” offered high-sugar cereal choices (Froot Loops, Cocoa Pebbles, Frosted Flakes), the researchers say. According to the study, 54% of kids who ate low-sugar cereal added fresh fruit, but just 8% of those served high-sugar cereal did. 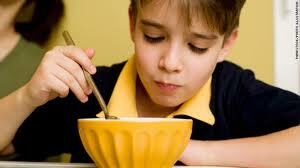 Children did not add more sugar to the low-sugar cereals than was already contained in the high-sugar cereals. The study supports the notion that children will eat more refined sugar when served high-sugar cereals, even when they are allowed to add sugar to low-sugar cereals. This approach also would give parents a chance to teach their children healthy strategies for increasing the appeal of low-sugar foods, such as adding sweet fruit like bananas of berries. The findings “also demonstrate that serving low-sugar cereals can increase the overall nutritional quality of children’s breakfasts,” the authors say. The authors warn that children who regularly eat a food with added sugar learn to prefer such foods, increasing their preference for sweeter cereals over time and possibly other sweeter foods in general. The study, published online, will appear in print in the January 2011 issue of the journal Pediatrics.